Single Burners 10 to 300 MMBTU/Hr. Engineering, quality components, and versatility result in a superior product. Engineered System – The total combustion system is designed using the latest in solid modeling technology to guarantee optimal performance, ensure installation compatibility, proper fit of all modules, and a user-friendly layout. Heavy-Duty Construction – Built for decades of operation, Faber’s windboxes are fabricated from 1/4″ and 3/8″ steel and the burner modules are comprised of industrial quality components from such manufacturers as Allen-Bradley, Ashcroft, Chicago Blower, Maxon, and Siemens. Faber’s package burners come standard with stainless steel impregnated paint to withstand the harshest of conditions or to color match in new applications. Flexible Design – Faber’s package burners are the best choice to meet your project’s most diverse requirements. Layout is customized to best fit your application. Flame geometry is tailored to your furnace. Modular design is ideal for field installation in the tightest of location. Our design also features custom control systems, specialized wiring, and unique fuels. Our packages are easy to install, operate, and maintain. 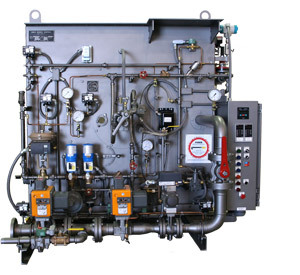 Ready To Operate – Prior to shipment, each combustion system is thoroughly inspected and rigorously tested on our process simulator to make certain the package burner arrives ready for operation. Practical – Faber’s package burners are combustion systems in their simplest, but most refined form. They are logically laid out for ease of operation and maximum accessibility to all burner components. Here are just a few of the many exceptional features that distinguish package burners: cured refractory throat or tile, two 2-1/2″ sight ports, ball/swivel scanner mount, as well as an industrial quality ignitor and two-piece oil atomizer assembly. The ignitor and atomizer may be easily removed for inspection and cleaning without dismantling the burner. Non-Proprietary – You are not held hostage by a manufacturer’s sole source parts that require specialized service. Our piping and electrical systems are comprised of industrial quality, brand name, readily available components that are easy to use, maintain, and service. 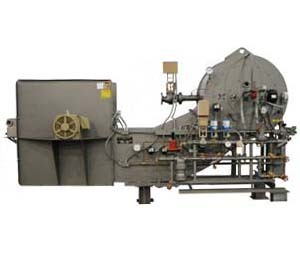 Smooth and Quiet Operation – Our package burners meet OSHA sound exposure requirements. A forced draft fan silencer and quiet running motor are an integral part of the package burner design. The efficient design results in a quick return on investment and phenomenal savings throughout the life of the equipment. High Mix Combustion Efficiency – This is determined by a burner’s ability to homogeneously mix fuel and air in the combustion process. Although excess air is inevitable in combustion, excess air also removes heat from the furnace, adversely affecting efficiency. Faber’s package burners operate at extremely low excess air levels (2% – 4% O2 in flue gas) when firing both liquid and gaseous fuels. 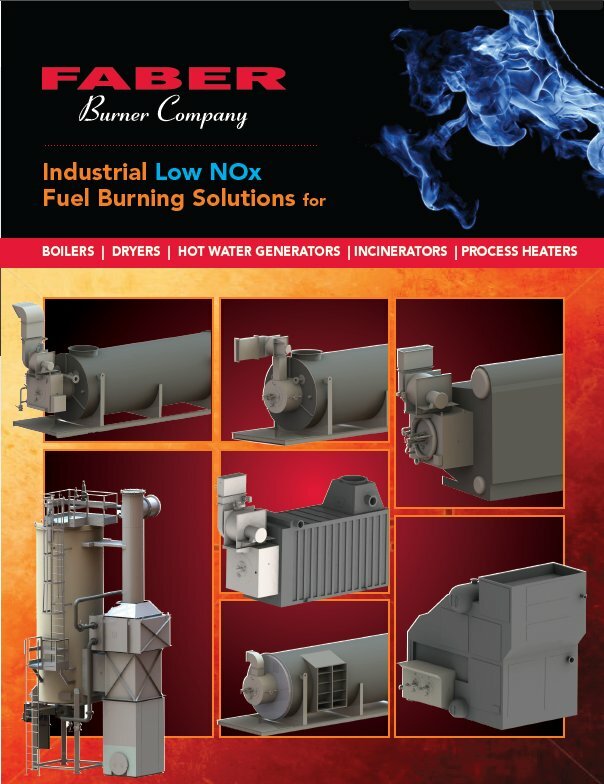 Faber’s package burners can operate at lower excess air levels than other burners (1 – 2 % lower O2 in flue gas while firing natural gas and 1 – 3% lower O2 while firing #2 oil), while still meeting NOx emissions, without smoke and negligible CO. Low excess air operation results in high efficiency, saving you money in fuel costs. Energy Efficiency – Faber’s low pressure drop register design, in conjunction with a highly efficient forced draft fan configuration equipped with a low leakage inlet vortex control damper and a premium efficiency motor, results in reduced power consumption. Thermal Turndown – This is expressed as a ratio between a burner’s maximum and minimum operating heat inputs. Higher turndown provides greater operating flexibility and reduces burner cycling. When a burner cycles, it flushes the hot furnace with ambient air, pulling heat out of the furnace and significantly reducing fuel efficiency. Turndowns of 8:1, to 10:1 are standard for most of our package burners.